Harness the power of Lightning: Use Visual Flows to capture information in Salesforce. Streamline and standardize processes. Accurately capture and store information. Eliminate errors. Improve reporting. These are some of the reasons why NYCAMH came to us to build a tool to track interactions with customers. NYCAMH is an occupational health and safety research, outreach, and clinic-based nonprofit organization that serves agriculture, forestry, and fishing industries from Maine to West Virginia. NYCAMH staff are constantly scheduling, planning, conducting, or evaluating training events for their customers. Because they are a nonprofit, NYCAMH receives funding from federal and state agencies, as well as charitable foundations and individual donors. They needed a tool to help generate reports to their funders. Seeing an opportunity to really change the way NYCAMH runs its inbound request process, we used Salesforce Visual Flows to build a custom step-by-step wizard to help the employees ask the right questions, capture the right information, and store it correctly in Salesforce. This made following up on activity for NYCAMH easy and reporting for the funding agencies simple. A farmer contacts NYCAMH to request an on-site training. The NYCAMH employee taking the request uses the Visual Flow to create a case, which is assigned automatically to the training coordinator. At the same time, several tasks are automatically assigned to other staff members: the training supervisor is tasked with assigning applicable grant(s), and the receptionist is tasked with making a follow-up phone survey when the event is complete. The coordinator uses Salesforce Chatter to communicate back and forth with the trainers to determine which trainer will be assigned to this event. Then the Coordinator or Trainer will create a NYCAMH Event, a custom object we created for NYCAMH that includes all the information about the farm and the type of training they need. When the training is complete, the coordinator will update the event record, including uploading Attendee Rosters, Farm Safety Survey reports, any Sub-contractors cost, and adding any notes. “The best thing I have found using Salesforce is having all of our information in one place and easily accessible to all staff. In the past we had to look in a several different places to find all the information needed to correctly complete a customer’s request. 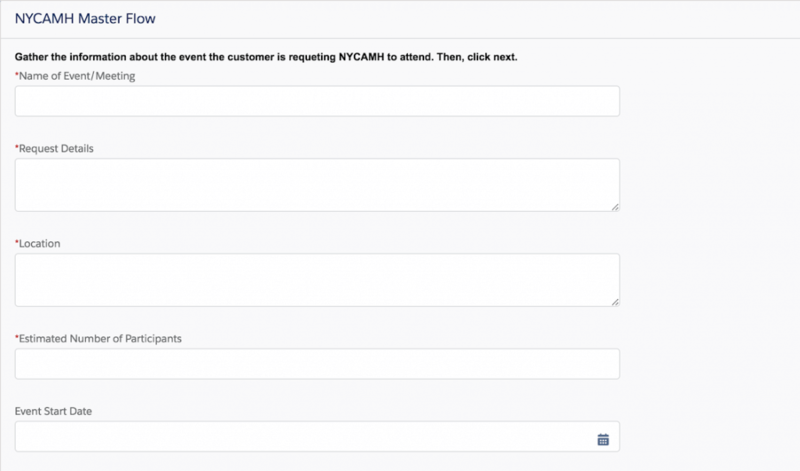 With the Chatter feature linked with a NYCAMH Event everyone can see all the correspondence associated with this event, no more lost emails!” – Pauline Boyer, NYCAMH Education / Outreach Coordinator. Contact us if you have any questions about Lightning or Process Tracker powered by Salesforce Visual Flows.